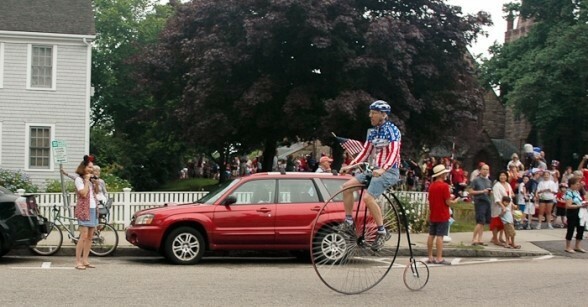 The July 4th Celebration in Falmouth Cape Cod will once again include the annual bike and carriage parade sponsored by the Falmouth Village Association. Participants will meet on the Village Green the morning of July 4th and the Parade will begin by heading down Main Street at 10am. Over the years this event has grown in size to several hundred who enjoy celebrating freedom on this special day. Children of all ages will be wearing their red, white and blue and it is great fun to see the great decorations people have adorned their bicycles and carriages with. From tricycles, to unicycles to tandem bicycles everyone gets in on the fun. After working up an appetite folks love strolling Main Street and stopping for a snack at Ghelfi’s Candies and Ice Cream of Cape Cod or Ben and Bill’s Chocolate Emporium or for lunch at any number of great eateries like Stone L’Oven, Anejo’s Mexican Bistro, Quarterdeck, La Cucina Sul Mare, Pickle Jar Kitchen or Pies ala Mode Cafe. The fun for our July 4th celebration does not stop with the parade and fun on Main Street. 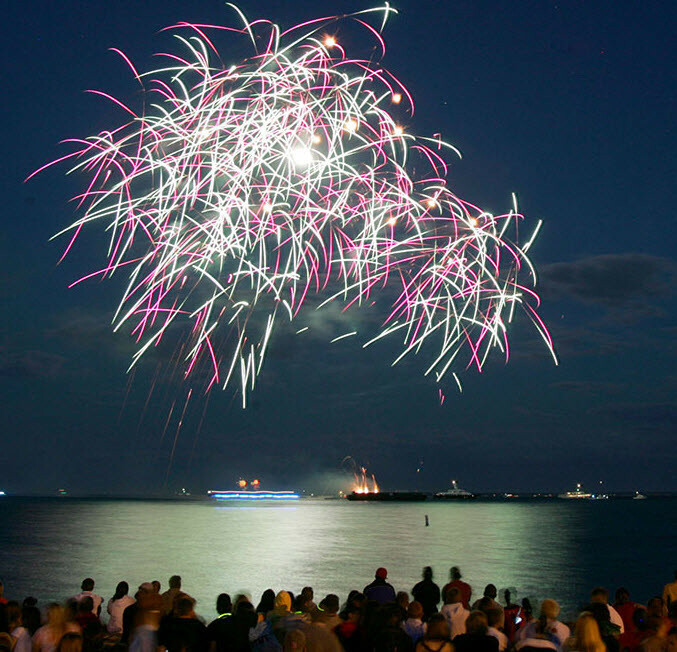 You should head down to Falmouth Heights Beach or Surf Drive Beach later in the evening to take advantage of the spectacular fireworks show set of on the barge out on the Ocean of Vineyard Sound. The Falmouth Bed and Breakfast Association is a proud sponsor of the Fireworks July 4th Celebration.